Thank you. I am so blessed to be a member of the American Hosta Society family and this is such a great honor that you are bestowing upon me. I was speechless when Chuck contacted me to tell me I would be the recipient of the Alex J. Summers Distinguished Merit Award for 2011. I was speechless because this is something I never saw coming. I know many of the previous recipients of this great award and there is no way, in my mind, that my modest contributions to AHS are anywhere nearly as significant as are those of my predecessors. I accept it with humility and with the awareness that there are many of our members out there that are much more worthy than I to be honored in this way. My love affair with hostas and The American Hosta Society began way back in 1984. Little did I know at the time that it would lead to me standing here tonight. It has been a journey that has resulted in many friendships that I will always cherish. While watching the Genus Hosta advance in so many ways over the years has been fun, it has been the people of AHS who have made the journey such a memorable event. I would like to thank the person who nominated me for the Alex J. Summers Award and I would like to thank the committee for selecting me to receive it. This is an honor that I perhaps rank as the second highest of my life, the first being when my wife Kathy agreed to be my bride some 41 years ago this month. You owe a thank you to Kathy, by the way, who wisely told me to ditch my original six page speech for this much shorter one. However, since I have a captive audience, I do want to talk to you about something dear to my heart, and that is the AHS Gift and Memorial Plan in general and the Alex J. Summers Endowment Fund Trust in particular. Like most botanical organizations, the AHS has found it challenging to do what needs to be done to keep itself vibrant and attractive to its members with the limited funding that is available. Our membership dues barely support the cost of the two paper Journals, let alone all the other activities that the AHS supports. The AHS needs our help on a sustained basis. That is why the Board adopted our new Gift and Memorial Plan a couple of years ago and established the Alex J. Summers Endowment Fund Trust. I encourage you to support both with your contributions. I encourage you to get into the habit of honoring your loved ones or AHS friends with modest contributions to AHS and to remember our members who are deceased with memorial contributions. I would even hope you would consider remembering the AHS during your estate planning if possible. Giving to AHS is easy. You can go to the AHS web site to download the form that you can use to direct your contributions or you may just write your instructions on a piece of paper for how your contribution is to be used and send it and your contribution to our AHS Gifts and Memorial Chair, Claudia Walker. Receipt of your contribution will be acknowledged and, if you have so instructed, any contribution in honor of or in memory of someone will be acknowledged to the family of the honoree. In lieu of flowers, I like to send contributions to the AHS in memory of the AHS and Georgia Hosta Society members who pass away. I hope you will do the same. I also hope you will encourage your local clubs to do the same also. If we all do this, we will be helping to keep the AHS great. You may direct your contributions to the general fund which has no restrictions on how it is spent. If you do not instruct where your contribution will go, it will be placed in the general fund. The AHS also welcomes contributions directed to special funds set up by AHS such as the Scientific Studies Fund, The Hosta Journal Color Fund and The Alex J. Summers Endowment Fund Trust. I like to direct my contributions to the AJS Endowment Fund Trust. This fund was established by the board in 2010. It is a restricted trust fund which means that only the interest and other income derived from the fund, not the principal itself, may be spent. The principal itself remains and continues to grow with each contribution to the fund. If everyone contributes regularly, the principal will grow to a significant amount over time and will generate ever-growing and much needed continuous income to AHS. I like to think of contributing to the Alex J. Summers Endowment Fund Trust as a permanent investment in the future that will continue supporting AHS long after all of us in this room are gone. Giving to AHS is a worthy endeavor. I do hope you will join me in supporting AHS with your contributions. While the printable form at the web site indicates there is a minimum contribution of $25, there is actually no minimum. I am sure AHS will appreciate every dollar you can give, be it $10, $25, or more. Now, I understand that as recipient of the Alex J. Summers Distinguished Merit Award this year, I am to select the Alex J. Summers Distinguished Merit Hosta for 2011. As I mentioned earlier, my love affair with hostas began in 1984. It all started while on a tour of daylily gardens in Auburn, Alabama. There, in a shady rock garden by the driveway entrance to one of the daylily gardens, serendipity struck when I discovered Hosta 'Tokudama Aureonebulosa'. It was just a single division but it was perhaps the most beautiful plant I had ever seen with its broad leaves and swirling intermingled colors. After all these years, I still feel the same thrill when I see 'Tokudama Aureonebulosa' as I did on that day in June, 1984; and on that day, a whole new wonderful world was opened to me. When I returned home to Atlanta, serendipity struck again. Right there in the Sunday issue of The Atlanta Journal and Constitution newspaper was an article about George Schmid who at the time was soliciting members for the Georgia Hosta Society which he was in the process of founding. George's telephone number was listed in the article. I called him to find out where I could obtain H. 'Tokudama Aureonebulosa' (and how to pronounce it, I might add). George told me to forget it since it would not grow in the South. After fifteen minutes on the phone with George, I was sold. George has been a valuable mentor to me since and I continue to learn from him today. Because of a hosta I can't grow and George Schmid, I am a member of The American Hosta Society. My obvious choice for the Alex J. Summers Distinguished Merit Hosta would have been 'Tokudama Aureonebulosa' but when I checked the list, it had already been designated a Distinguished Merit Hosta by another recipient of this great honor, Mildred Seaver. As all of you are well aware, Mildred died earlier this year and with her passing, AHS lost one of its greatest assets. I did not know her well but each contact with her was always a treat to be savored and remembered. Like George Schmid, she was a hosta pied piper and she was obviously a great lady. Also in checking the list of Distinguished Merit Hostas I noticed that, as of yet, a Mildred Seaver hosta had not been selected. Mildred hybridized many great hostas in her lifetime and I thought it appropriate that one of her hybrids should represent her on that list. 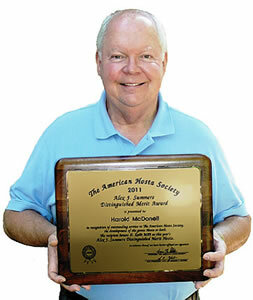 As my tribute to Milred Seaver, I decided to select one of her's to receive this honor. Immediately upon making that decision, the image of Mildred parading around in her wonderfully ridiculous hat at the hosta hat competition during the convention in Philadelphia a few years ago came to mind, and I decided that the hosta which her hat represented would be my choice for this year's Alex J. Summers Distinguished Merit Hosta. I don't think I need to expound on why this great Mildred Seaver hosta is worthy of this award. Most of us already know it, we grow it, and we love it. 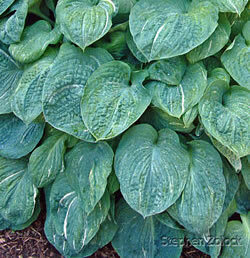 With possibly the exception of H. 'Blue Mouse Ears', it is the most aptly named hosta that I know of. Ladies and gentlemen, the Alex J. Summers Distinguished Merit Hosta for 2011 is Hosta 'Spilt Milk'. Again thank you for this great honor. I will always cherish it.